It was extremely calm till 0230 when a slight roll started. The wind was 10 to 15 knots most of the night. We get up at 0340 and make some tea and coffee and at 0400 we pull up the anchor and motor out. We have the radar on and as normal, we revert to our night time rules, lifejackets on when outside the cabin. The wind is 12 knots from the north so we pull out the screecher. We are motorsailing and doing 5.5 knots into a 0.3 knot current. From 0530 the wind increases to 20+ knots, we are doing 6.4 knots into a 0.7 knot current. We keep the engine on even though we could sail at perhaps 5.5 knots as we need to average at least 5 knots to get to South Percy Island before dark and we expect to have lighter winds later in the day. It is starts to get light now. The sea is about 0.75 metre from the port quarter. At 0600 Kelly takes over at the helm and Michael takes Veto into our bed as she is much more relaxed here. The wind hits at least 24 knots and we do 7.3 knots, even hitting over 8 knots a few times. The seas are now quite rough, but it is not too bad since we are basically going with the seas. At 0800 Kelly logs on with VMR Mackay for our trip (this is when they open for business). Soon after the wind drops to 11 to 15 knots and turns to north-west so we change the sail to the port side. At 0930 the wind goes south-west. It is overcast and we have a bit of rain. At 1200 we pass Digby Island, the wind is now only 9 knots but the seas are very sloppy and confused. At 1300 we pull the screecher in as the wind is only 6 knots. Kelly spots a few whales and a sea snake and Michael runs the watermaker for an hour to top up our water containers. 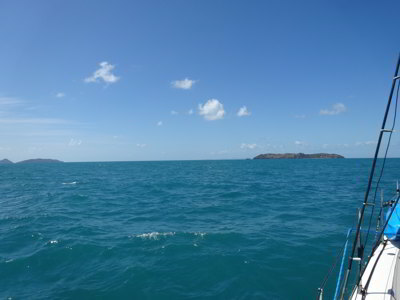 At 1330 the wind is only 3 knots and the seas are much calmer. At 1445 the wind goes north-east! Talk about four seasons in one day, it is now sunny as well. We put the screecher back out in 7 knots and we pick up half a knot. All day we have been sailing into a current. We should have had current with us for the first couple of hours and then against us for the next six and then behind us again. However, we end up having it against us for the whole day. At times it hits 3.0 knots, but mostly it is 0.5 to 1.0 knots. As we pass the south-western corner of Middle Percy Island, we pull in the screecher and turn on the second engine as the wind has gone south-east (on the nose) and we have 2 knots current against us. 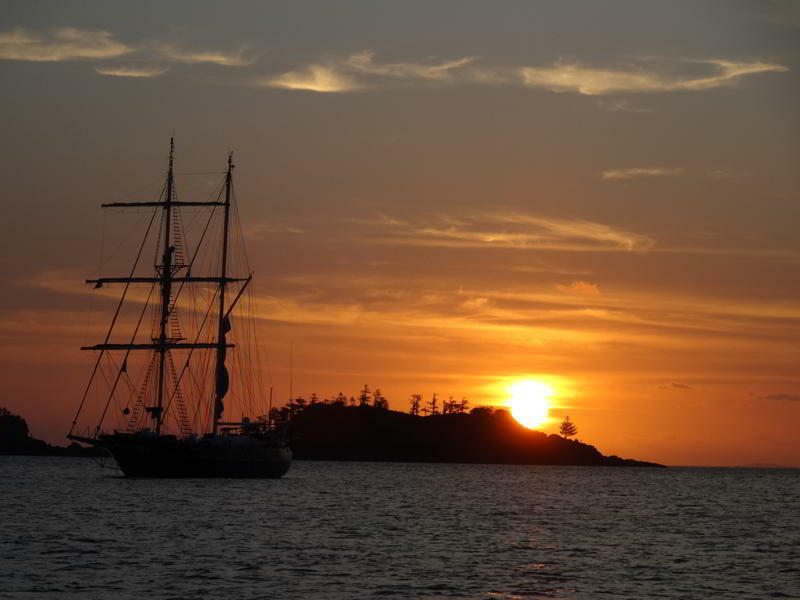 We motor the rest of the way and at 1720 we anchor in Rocky Shelf Bay on South Percy Island. This has been a long day. We tidy up and settle down for the evening. It is quite calm here considering the strong northerly winds earlier today. 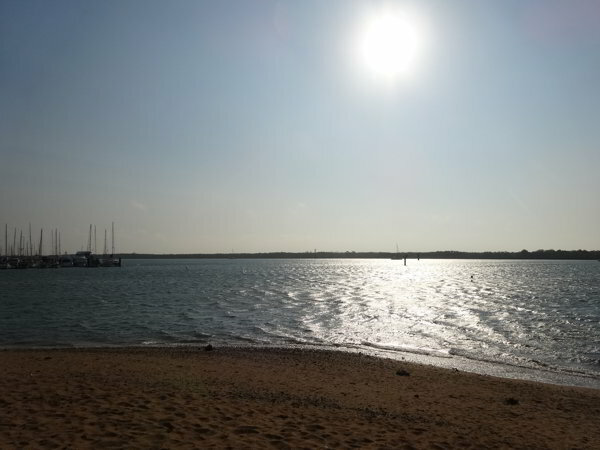 We have come here as there is a south-easterly change forecast for the evening (it hits just after 1800 – 19 knots). We are called on the radio by Pandion. This yacht was anchored at West Bay on Middle Percy when we passed and then went to Blunt Bay on North Percy Island but it is too rough there. We tell them that there is room to the east of us. 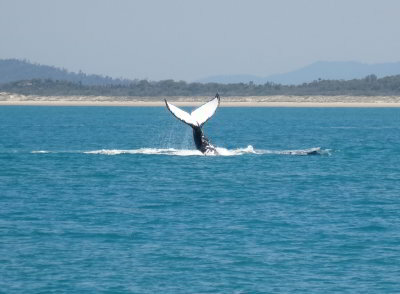 They anchor about 100 metres away at about 1900. The wind is now only 12 knots. 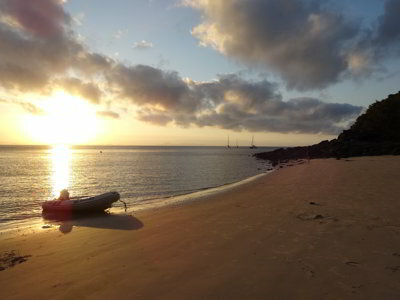 We have showers, very late sundowners and curry sausages and rice that Kelly prepared last night. The wind dropped about 2300 to 10 knots but at 0230 it was back up to 20 knots. The water was calm. We hung side on to the wind due to the tide, it is very strange here. We get up at 0800, the wind is 20 to 25 knots south-east. After breakfast we hear the forecast which is for south-easterly winds for at least a few days. After Kelly does some cleaning, we go to the beach. We show Pandion (Miles, Melissa and their kids Reminy, Malachy and Sylvie) the best place to access the beach when there are some waves (behind the rocks to the west). We walk along the two beaches while the kids do their schoolwork on the beach supervised by their parents. We go back to Catlypso and have lunch. After this we service the genoa winch, it is much cleaner than the other three winches as it is not used as much. Later Michael makes cinnamon crumble muffins for afternoon tea. It has been a bit rolly since 1300 and it gets worse as the wind is now 15 to 20 knots. Michael goes into the beach and it is a very rough trip back. He decides to head towards Chase Point to check out the anchorage off the second beach from the point. It is much, much calmer here, so we decide to move. 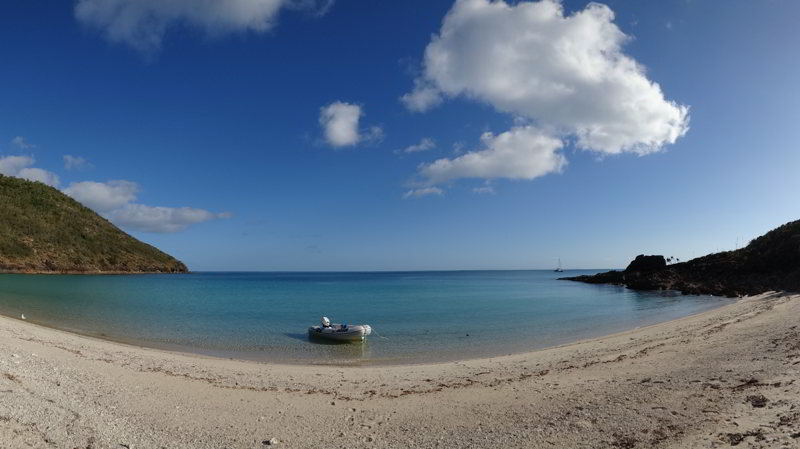 At 1630 we anchor off this beach. Around this time the wind drops to under 15 knots and the old anchor spot calms off a lot. We only have a little bit of rolling. We have spring rolls as an entrée and then pork ribs and fried rice. Michael has a night off drinking (Kelly has hardly had a drink since she got sick four weeks ago). Later we listen to the Brisbane versus Penrith NRL semi-final, Brisbane win. It is quite cold tonight, we sit inside all night. We go to bed at 2030 and listen to the radio broadcast. It was a relatively calm night, at least wind-wise. There was a slight roll, but not too bad. 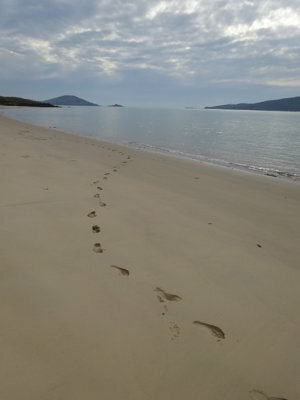 Michael gets up at 0800 and goes to the beach and walks over to the other side of the island. 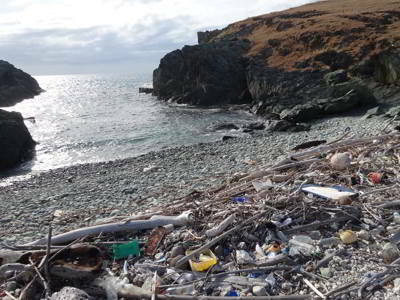 There is a small bay here and lots and lots of rubbish and wreckage. He finds parts of boats, a 12 volt refrigerator, a large float and more. Once back, we have breakfast. Pandion heads out for West Bay on Middle Percy so we call them on the VHF and asked that they let us know what it is like. 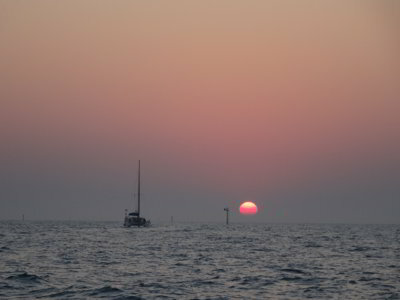 The forecast today is 10 knots easterly, but after the winds of the last 40 hours it may still be rolly there. We see that Pandion is taking the long way there (sailing all the way). We end up leaving at 0945. We motorsail as we have a 2 knot current (minimum, hits at least 3.0 at Hixon Point) against us. The wind is 17 knots south-easterly and we do 4.7 knots with the engine at 3200 rpm. We anchor in West Bay on Middle Percy Island at 1155, just after Pandion even though they left hours before us. It is quite rolly and we think we should have stayed at South Percy. After lunch we go to shore and walk up the track to the spot where you can get phone coverage (Telstra only). We check the weather and download emails etc. The weather is looking no good for us to go south till Tuesday at the earliest. We also stop off at the book exchange and put in 10 books and take out 5. The selection is not very good and has not been on our four stops here. We have certainly put in far better books than we have taken out. 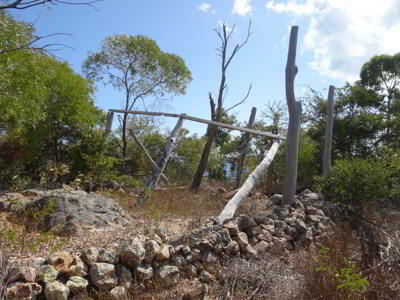 We also go to the ruins of the 1880 homestead built by Captain John Cook Till. He lived here (with two wives apparently) from 1880 till 1887. We meet Rod and Sandy from Emma-Kate and David from Leana (also from The Shire like us) and make arrangements to have sundowners in the A-frame hut at 1700. We go back to Catlypso at 1515, it is far better now than when we got here. We have to re-anchor as we are now too close to Pandion (we think they rode over their anchor while we swung towards them). At 1710 we go to shore and have drinks with the previously mentioned boats as well as Sasu II and the island caretakers. It was a nice evening. We get back to the boat at 1835. We have showers and then curry chicken and rice. Three boats come in later after dark. We listen to the other NRL semi-final, Eels versus Cowboys. The Cowboys win. Bed at 2145. It was a fairly calm night, some slight rolling, but overall okay. The wind is under 6 knots when we get up at 0800. Michael takes Veto to the beach and then we have breakfast. A few boats leave for south. Michael adds fuel to the dinghy and 66 litres of diesel to the main tank. We also adjust the shower door as it was scraping on the lock. At 1000 we go to the beach. We take lunch and some morning tea as we plan to stay here most of the day, it will be more comfortable than sitting on the boat. We laze around, reading and swimming. After we have lunch, we again walk up the track to the phone spot (the easiest spot we have found is by turning right at the sign to Rescue Bay and stopping on the ridge). We get the weather, still looks like it will be Tuesday at the earliest before we can leave. We go back to the A-frame and hang around till 1620. We are having a goat stew tonight courtesy of the people who live on Middle Percy (Kate and John) and the caretakers (Ernst, Lindsay and ???). Ernst shoots a goat and then they butcher it (assisted by the kids from Pandion). 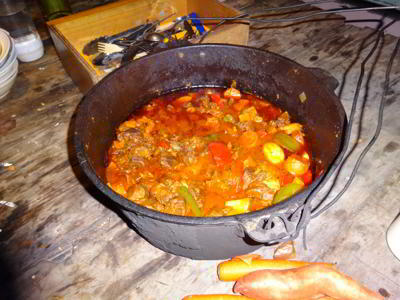 The yachties bring along vegetables to go in the stew. 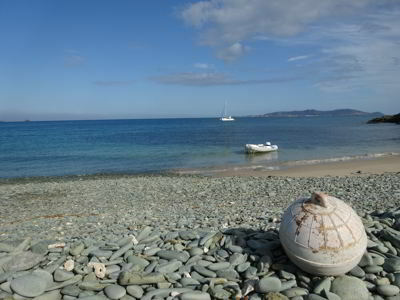 We are back on the beach at 1710 and we bring along some tomatoes, capsicum and shallots. Michael cuts up the onions, garlic and some pumpkin, Kelly does more pumpkin, David from Leana does other bits. Ernst cooks it in a camp oven over the open fire. First he boils the goat meat in sea water. When it is all evaporated, he adds the above ingredients as well as some curry powder, sweet potato, carrot, tomato paste and the milk from six coconuts. We have 20 people present, we all get a good serving. One boat brought a loaf of bread which was great for cleaning up the plates. An excellent meal, the goat was so tender! Later the crew from a huge yacht comes in (name withheld to protect the guilty). The skipper (a professional) was so pissed he could hardly walk. His crewman was also full, but not falling over. We ended up with free wine as they brought in a crate of wine from the owner’s cellar (he also makes it). God knows how they got back to the boat, at least there was someone still on it who (may) have been sober. We leave at 1955 and find that the tide has come in and partially flooded Thunderbird 2. We have to pull out the bung and run around for a bit to get rid of all the water. The wind is now 10 knots easterly and it is a bit rolly. We go to bed at 2130. It was a great evening! It was a bit more rolly last night than the night before, but not too bad. We get up at 0800. We decide to move to where Pandion was anchored but we get beaten by another boat. The huge Young Endeavour comes in and anchors out wide. They spend all day here and leave in the evening. 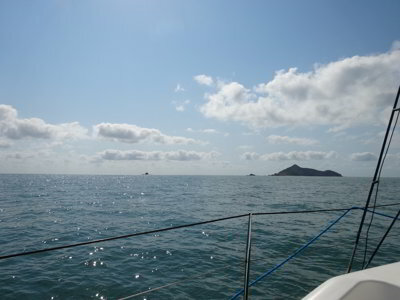 It is sunny but the wind is 15 to 22 knots easterly. We end up moving a bit closer to the northern side of the bay. After this we go to the beach again (0930). As we did yesterday, we take water and food and spend all day here. After lunch we walk up the track, this time going past our normal spot in the hope of getting better phone reception. However, it was just the same and we walked 20 minutes more each way. Again the weather shows that tomorrow may be okay and Wednesday better again. We decide that we will go tomorrow so long as when we get up the wind is under 15 knots (forecast is 10 to 15 knots south-easterly to easterly and going north-easterly later). 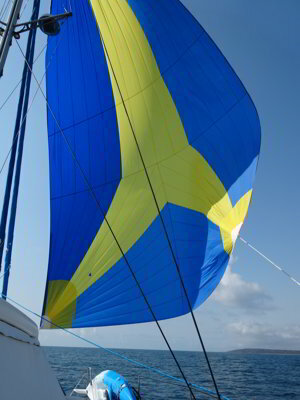 We need at least easterly to use the sails and preferably north-easterly. Michael starts to read a new book, A Clockwork Orange. He gives up after five pages as the made up words are too hard to figure out. We are back on Catlypso by 1635. At the moment the tides are huge and the difference enormous. Tonight’s high is 6.4 metres and the low early tomorrow is 0.3 metres, so correctly judging anchoring and where to leave dinghies on the beach is essential. The wind today was 15 to 20 knots from the east and later north-east. The water ends up quite calm. We run the generator for 30 minutes so we can have hot showers, lovely. We have some nibblies but no grog. Dinner is some left overs from other meals. The wind drops to 10 to 12 knots but it gets a bit rolly after high tide. It was fairly calm overnight and at 0445 we get up. We make tea and coffee and at 0505 we head off. We see on AIS that Leana must have left about an hour ago as she is over four miles south of us. We motor out and then at Hixon Point pull out the genoa and motorsail. The wind is 15 knots or so easterly. However, there is a strongish current from the east that not only slows us, it pushes us towards the west. We need to head 20 degrees to port to maintain the right direction. We make about 4.4 to 5.2 knots with 1.0 knot of current against us. The seas are quite rough, 0.75 to 1.0 metres and very close together. After a while we realise that we cannot head in the direction we want to (that is to the east of Steep Island) due to the cross-current, so we change to go to the west of Otterbourne Island. Our hope is that by the time we get there the tide will change meaning we have an opposite cross-current and the wind will go north-easterly as forecast. As we near Otterbourne, we change to the screecher. We increase our speed dramatically and cut back on engine revs. We could sail but we need to keep up the average speed. Once we pass the island, we have to turn to port a fair bit, so we have to go back to the genoa. We are doing about 4.7 knots in 12 knots of wind. We soon cross over Leana’s track as David tacks back (he is not motoring at all). We pass within 50 metres of each other. 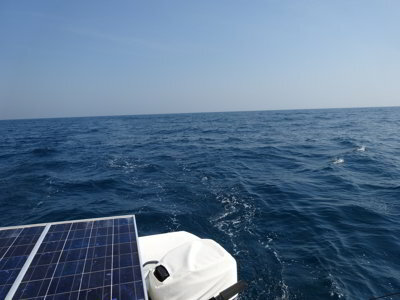 At 1230 north-west of Cape Townsend we cross a line of standing waves that are mostly breaking. This is some sort of tidal confluence. Before this the seas are largish but smooth, after it they are very rough, some swells are over 2 metres. We now have a current behind us and are doing 6.7 to 7.0 knots with the engine only doing 2400 rpm. As we pass Strong Tide Pass we have to pull in the genoa as we are going too far towards the land and the wind is now on the nose. However, closer to Island Head Creek we pull it back out. 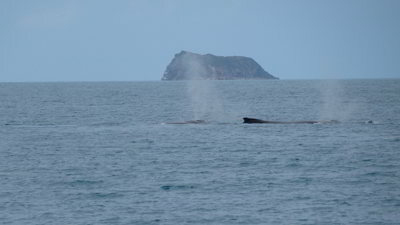 We have seen lots of humpback whales today, one surfaced only 30 metres from us near Strong Tide Pass. As we approach the entrance to Island Head Creek, with log off with Coast Guard Thirsty Sounds and pull in the sail. We motor in and anchor off the western beach opposite the entrance. It is extremely calm here. We have showers and sundowners and then Michael cooks lamb rissoles to go with a salad Kelly makes. Michael then updates this blog, lots to do as he has not done much since we have not had internet access for almost a week. We have some access here so he may be able to upload the files. We listen to music and then go to bed at 2200. The wind is under 8 knots. It was an extremely calm night, no wind and flat water. We get up at 0800 and Michael takes Veto to the beach. We then have breakfast. 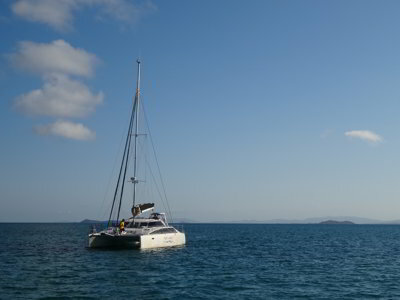 Sasha-B leaves for Great Keppel island, they were going to head to Port Clinton like us. We wait till the tide is supposed to change before leaving so we have current behind us all the way. However, despite the high tide being 0936, when we leave at 0945, the tide is still incoming. In fact, it does not change in the open ocean till at least 1045. 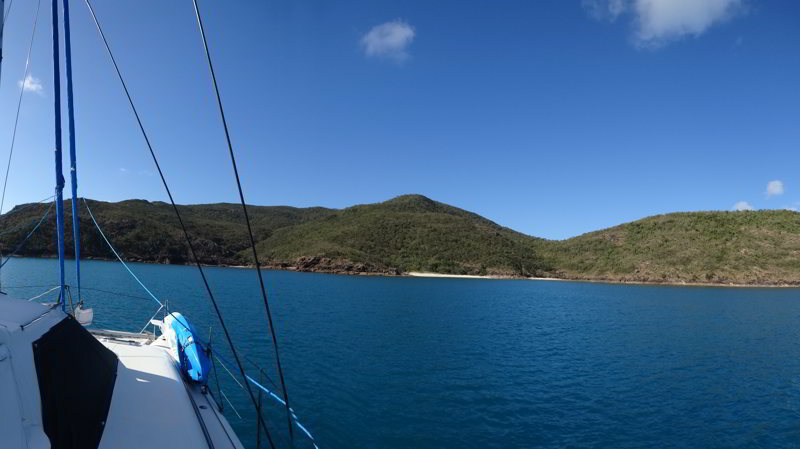 We motor out of Island Head Creek with the main sail up. Once outside we pull out the genoa. 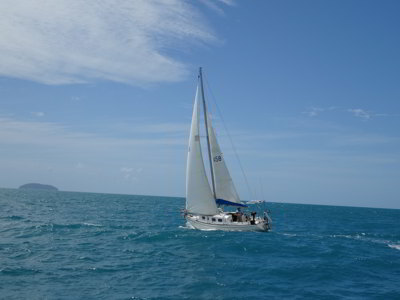 We have to motorsail as the wind is close hauled. At 0945 we see something in the water a mile or so north of Split Island. We change course and go over to see what it is. 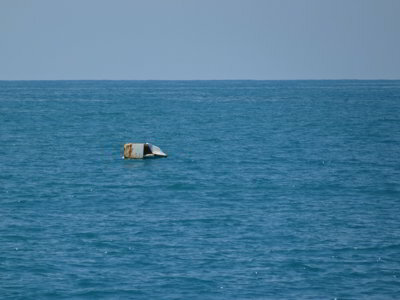 From a distance it looked like a dinghy and then perhaps a life raft. However, once we get closer, we see that it is a large refrigerator. A few days ago we heard Coast Guard Thirsty Sounds put out a Securite about this. Michael plotted it at the time, it has moved three miles north since then. Michael calls the coast guard and reports its new position. It could cause a lot of damage if it was hit. It is far too big for us to do anything with it. We get back on course and soon we can sail. We do about 4.4 knots, but at times hit over 5.0. The wind is only 7 to 10 knots but luckily we have a slight current behind us. We hear on the VHF about now that a yacht is being taken into Keppel Bay Marina. It has been run into by a power boat and is taking on water. Two of the passengers on the yacht have been hurt. 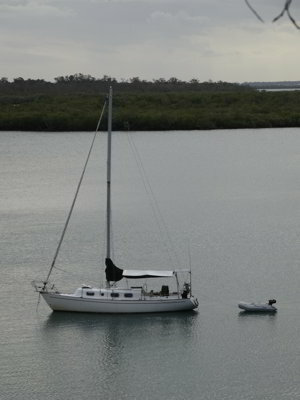 We later read (and hear on ABC Radio News) that the power boat was not paying attention and ran into the yacht. Idiot!!!! At 1215 we drop the sails as the wind has died. We are also about to enter Port Clinton, so there is no point keeping them up. We motor in and decide to anchor off Perforated Bay, the first inlet on the northern side of Port Clinton. It is very protected here from the slight easterly/north-easterly wind. 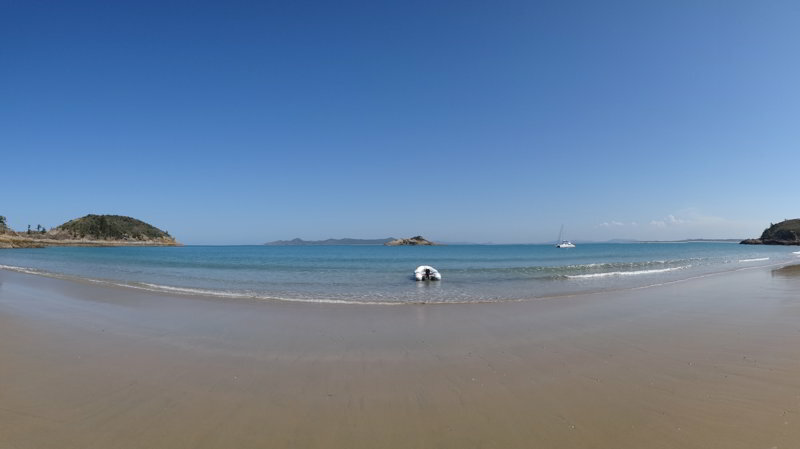 We drop anchor off the beach in about 4.8 metres, with the tide to go down 2.1 to a low of 0.1. In fact, it only goes to 3.1 later rather than the expected 2.7 metres. After lunch, Kelly books the marina at Keppel Bay for Friday. We then go to the beach and walk a couple of laps. When we come back, we relax a bit and Michael cleans the boat trip log which has been sticking a bit. This is a very smelly job as the salt water has gone off and stinks. He also flushes the watermaker and adds the last container of diesel to the main tank. At 1700 he takes Veto to the beach again for a run. We then have showers and sundowners. We have rump steak and sausages cooked on the barbecue with pasta. The wind has dropped to 7 knots from the 10 to 12 earlier and there are no bugs, unlike last night. We go to bed at 2130 as we have another early start tomorrow. It was a calm night. We get up at 0525 and make tea and coffee. We pull up the main and then motor out at 0555. Once outside we pull out the screecher. There is only 8 knots of north-east wind, so we do not get much assistance at all. 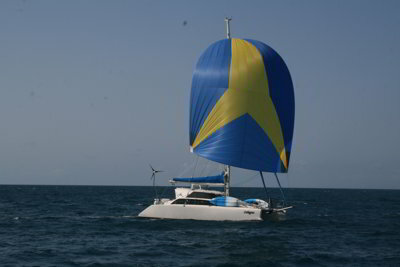 We motorsail at 2400 rpm doing 4.4 knots into a 0.5 knot current. As we head south, we are called by name on the radio by “Singapore warship”. They asked us to turn to 90 degrees for one mile. We are not sure what boat this is as all we can see is a cargo ship called MV Avatar. This is anchored wide out from Freshwater Bay and has AIS. Later on we see that there is a warship much closer into the shore. It turns out that this is RSS Resolution, a landing craft warship which also carries helicopters and troops. It is doing manoeuvres with the ADF. Avatar is also a Singapore Navy ship, used to support its warships. It has a large deck above the main deck, probably for landing helicopters on. We think that this ship is probably the one that called us as we would have passed within a few hundred metres of it on our original track. 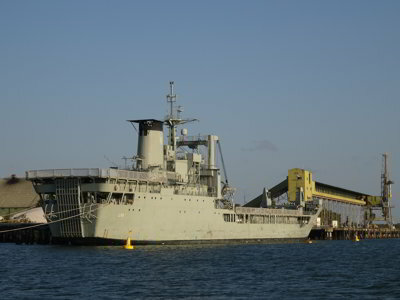 The ships are here as part of a training exercise with the Australian Defence Force. We pass Cape Manifold at 0850, this time the current here is not too bad, only 2.0 knots against us. It is choppy but nowhere as near as bad as 2015. We see lots of whales again today, at least a dozen, six of which were calves. At 1140 we are still heading into a 0.5 to 0.8 knot current. We should have had it behind us by now! Soon after Michael rings the Capricornia Cruising Yacht Club and books dinner for tomorrow night. They only do dinner on Fridays and it is catered by the members, so they need to know exact numbers. 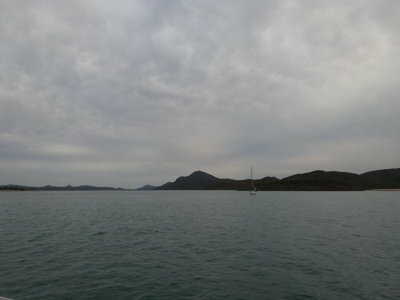 At 1330 we pass to the east of North Keppel Island and then go between Middle Island and Great Keppel Island. Just before here we pull in the screecher and just after, we drop the main sail. 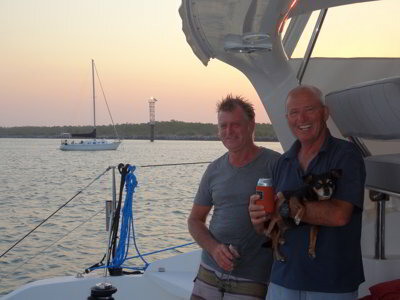 We motor over and at 1500 we anchor off the southern end of Fishermans Beach. Another Lightwave 38, Red Undies comes in from the south. In September 2016 Michael drove it from The Boatworks to one of the marinas at Southport as the owner, Ken, was recovering from a severe leg infection and had to keep his leg elevated. We say hi to Ken and Judi. 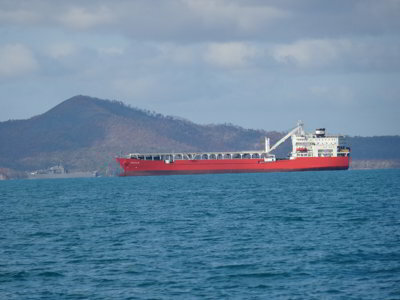 We see on AIS that Leana is anchored off Long Beach which is on the southern side of Great Keppel Island. We head off in Thunderbird 2 and run the 1.7 miles around and find the boat. David invites us aboard for a drink and some cheese and biscuits. We head off as it starts to get dark. 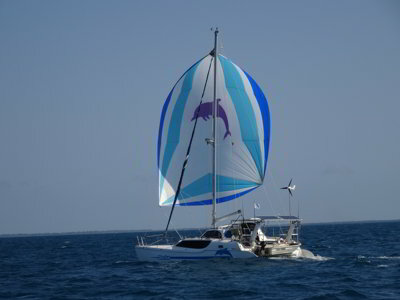 We also see Singing Duo one of the few Lightwave power cats built. On the way back we stop at the beach to the south of where we are anchored, very nice. We have showers and then lamb souvlaki wraps. We go to bed at 2200. It was fairly calm till 0230 when it got quite rolly till 0430. The wind was 17 to 20 knots for this period and Michael was awake from 0245 till at least 0415. Not a nice night. When we get up at 0700 the wind is only 6 knots and it has calmed off. We make breakfast and at 0730 we head off. We have to motor all the way, although we do try to motorsail for short time. The wind ends up even less. We head into the fuel wharf, not the easiest place to tie up at as there is a strongish outgoing tide. We finally manage to moor at 0925 and fill our tank (48.5 litres) and all our containers (110 litres). The price is reasonable, $1.32 a litre. We then motor to our berth and tie up at 0950. Kelly heads off to pay and also books the courtesy car for 1445. She then puts on our washing. Meanwhile Michael flushes the watermaker, refills our water tanks, washes the solar panels (covered in salt) and the anchor chain. He also washes the windows. Later a very small 9 metre yacht with a couple and three kids comes in and stops at the end of the marina. It must be very squashed inside, hard to see where they could all sleep. After booking in, the father attempts to leave the wharf but the strong northerly wind which is now blowing means his very small outboard does not have enough power to get him off the wharf. I suggest he reverse and he does get off, but I fear that he is going to be blown into other boats such is the lack of power. However, all ends up okay and he gets to his berth. At 1445 we get the car and drive to Yeppoon. Michael drops Kelly at the shopping centre and then heads off to get some beer. He finds what he wants, Tooheys Extra Dry cans at BWS for $88 for two 30 can cartons. A bargain. He comes back and helps Kelly finish the shopping. We are back at the marina at 1600. We put everything away and then have showers. 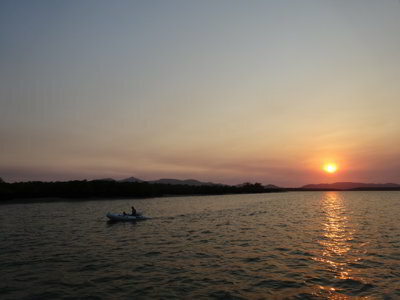 At 1750 we walk to the Capricornia Cruising Yacht Club for dinner. The menu tonight is steak and pork rashes with salad and dessert of bread and butter pudding (made with raisin toast). The cost is $15! We have a few beers and wines and enjoy a very nice dinner. We take Veto with us as pets are allowed in the beer garden area. Tonight is the first preliminary final in the NRL, Brisbane versus Melbourne. Michael has been watching it on his phone and back on Catlypso he watches the rest on TV. Melbourne kills them 30 to nil. We go to bed at 2200. Since 1100 it has been a constant 17 to 20 knots north-easterly, but by 2150 it has dropped back to 10 knots. 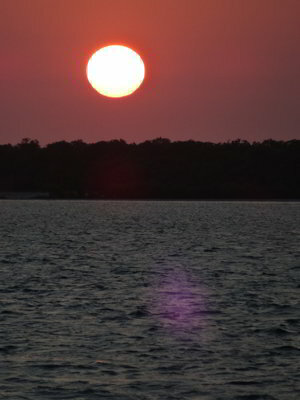 We get up early as the forecast for today has reasonable winds in the morning but increasing to 20 knots late morning. We get up at 0545. Michael takes Veto for a walk as she will not be able to get one till tomorrow afternoon. We make tea and coffee and at 0615 we motor out. We have about 7 knots of wind behind us (north-westerly) and pull out the screecher. As normal, we have current against us so we only make 4.7 knots. The wind drops to 3 knots. At 0915 we finally get the current with us and also later the wind increases to 9 knots and then later 15 or so. This gives us a good speed although we still need an engine running. 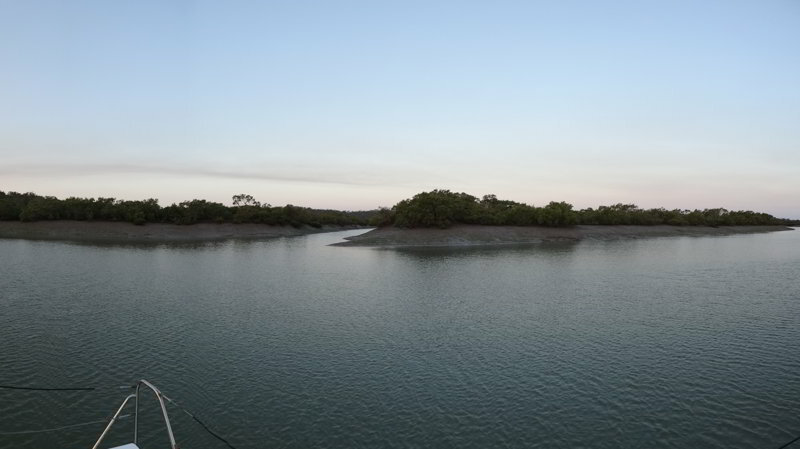 The water gets brown as we near Sea Hill (the outflow from The Narrows and the Fitzroy River). The seas are fairly flat, although every now and then there are some larger swells on our beam. We motorsail all the way up The Narrows (the stretch of water between Curtis Island and the mainland) till we get to Badger Creek. We pull in the sail and then motor into the creek. We go past where we anchored in 2015. We end up anchoring at 1250 a fair way in at the intersection with a smaller unnamed creek. The depth under our keels is 6.7 metres with the tide currently 3.9 metres. It will drop to 1.2 metres. This means we should have a depth of 4.0 metres at low, but it turns out we have 3.5. Not sure why. 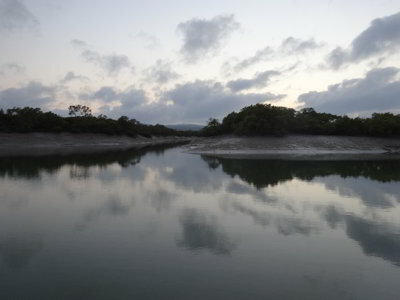 This creek has very mud steep banks and there are mangroves everywhere. This is definitely crocodile country. In fact, a 5.2 metre monster was shot dead (illegally) in the nearby Fitzroy River a few days ago. After lunch, Michael takes Thunderbird 2 and runs almost a mile up the creek to another intersection. He sees no evidence of crocodiles on the mud banks. We end up with our stern only 18 metres from the water’s edge at low, but a check using our portable sounder shows that we still have plenty of water at the stern. The wind is anywhere from 7 to 17 knots, but later drops to 7. We read and relax and then have showers and sundowners. We go inside and lock up at sunset as midges are around, not too many, but enough. We have lamb souvlaki wraps again. We watch the second preliminary final on TV (amazing we get it here). North Queensland beat Eastern Suburbs 29 to 16. We also see on AIS that Leana is at Lady Musgrove Island, almost 80 miles from us. It turns out that we get heaps of midges inside, they come in through the fly screen on the door, they are that small. Despite their size, they can certainly bite! It was a very calm night, so we had lots of midges all over the place. They even get into the bed under the sheets and bite us. Michael has heaps of bites all over his arms, shoulders and some on his legs. We are awake at 0645 but do not get up till 0815. We have breakfast. We stay inside till the wind picks up and then we know that the midges will not be around. However, we then have to clean up all the dead ones, even outside. We have no idea why they just die. 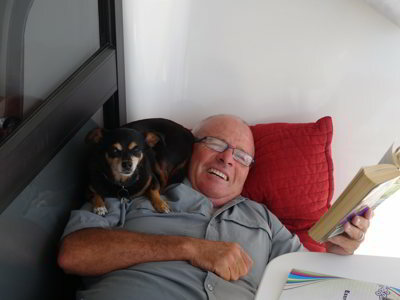 We read and laze around till 1040 when we motor out of the creek into The Narrows. The Narrows has a long section where at low tide there is no water covering the “channel”. In fact, there are two tracks that cross where cars etc can cross from the mainland to Curtis Island. As such, you can only traverse The Narrows at or near high tide, and the tide has to be high enough to put enough water over the sections that are above LAT (Lowest Astronomical Tide). The highest of these is 2.2 metres, meaning that at any part of a tide with less than 2.2 metres, they are above water. We learnt a new way to work out how high the tide must be to get across. This comes from one of the radio operators at VMR Gladstone. You need the high tide at Gladstone to be 1.5 metres plus your draft. 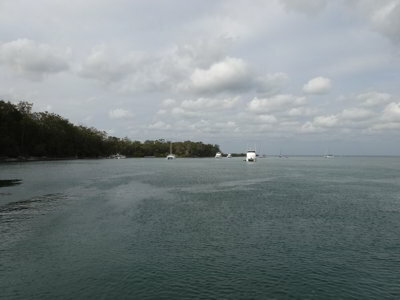 Therefore, as we draw 1.1 metres, the Gladstone tide needs to be 2.6 metres. This gives about 0.2 metre clearance apparently. Based on today, with a tide of 3.6 metres, then we should have 1.0 plus 0.2 metres clearance. The lowest we see is 1.2 metres under our keels, exactly as predicted. You also have to time it so that you get to the meeting point of the incoming tides (it comes from north and south) at high. 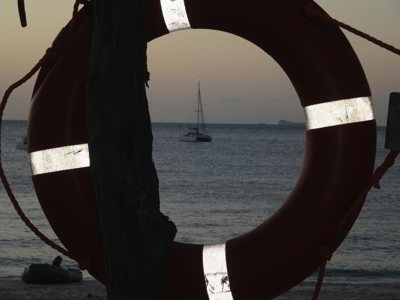 This means you do not need to fight against the current which can be up to 3 or more knots. We time it perfectly and have current behind us the whole way. We pull out the screecher for the last few miles run down to Graham Creek from Black Swan Island. We do anywhere from 4 to 6 knots as the wind is going from 7 to 15 knots from astern. We pull in the screecher as we enter Graham Creek. We go a bit further up to get out of the north-westerly wind and anchor at 1315. After we have lunch, we take Veto to the beach on the corner of the creek. It is still blowing quite hard, but the water is flat. The wind hits 23 knots later on. Michael takes Veto to the beach again at 1700 as we will not have time in the morning. We have showers, sundowners and again sit inside due to midges. Dinner is roast port roll and vegies. The new series of Dr Blake Mysteries started last week on ABC, so we decide to watch TV later, a rare occasion. We go to bed at 2200. We have another very calm night. We get up at 0445 and after making tea and coffee, we head off at 0505. We leave early for a couple of reasons. 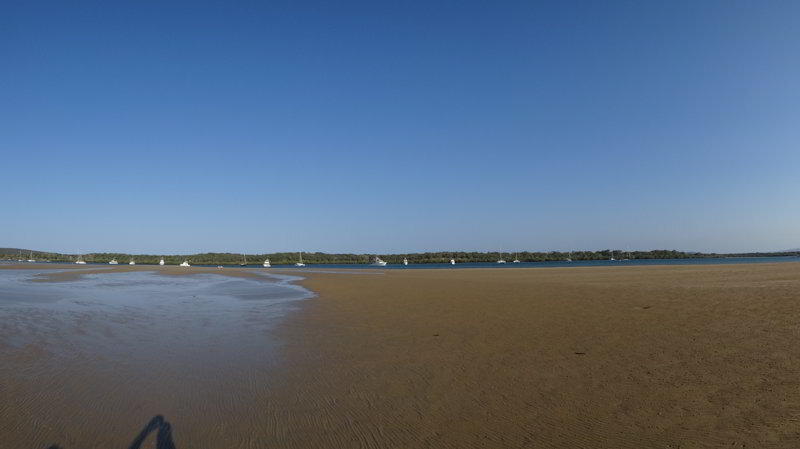 The first is to catch the outgoing tide as the tidal flow through Gladstone can be very strong. It takes over four hours to get out of the harbour area, so the difference between a positive and a negative current means a lot. You also cannot really sail at all for most of it due to the shipping and narrow channels. The second is to try to beat the very strong winds forecast for the afternoon. We have the current behind us for a couple of hours, well past the advertised low tide of 0530. We then have little current till about 0815 when we slow down. We have now passed all the coal loaders, the aluminium refinery (where bauxite is unloaded) and the LNG wharves. We are now out of the main part of Gladstone Harbour so we pull out the screecher and this gives us another 0.5 knot in light winds. At 0930 we turn off our engine as we have 17 to 20 knots of wind pushing us at anywhere from 5.2 to 6.4 knots (1.5 knots current against us). At 0945 we leave the marked channel leading into Gladstone. 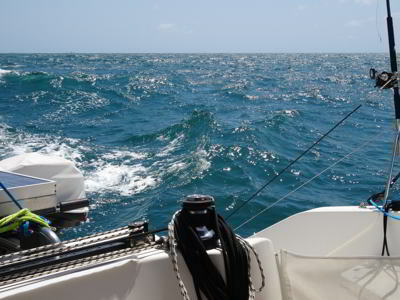 The seas build up as the wind is a constant 20 knots later, hitting 23 knots at times. We have a one to one and a half metre sea from the port quarter, but despite this, it is not too bad. We sail all the way to Pancake Creek and pull in the sail as we near Clewes Point. 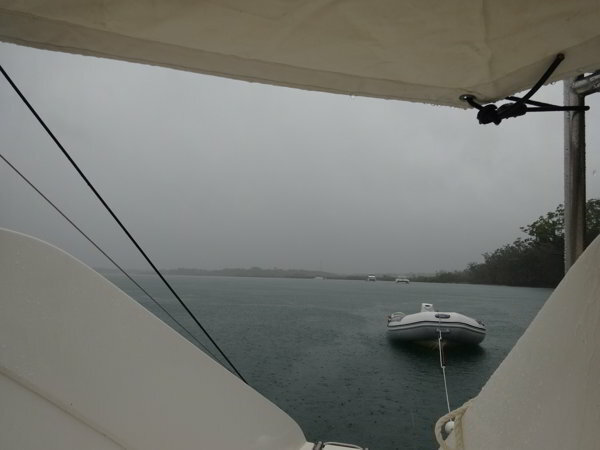 We turn on both engines and enter Pancake Creek through very rough seas. We have 1.2 knots against us. We are thrown around a bit but it is okay and once we get inside it is a lot calmer. We motor right to the end of the anchorage as there are 21 boats already anchored here. We anchor at 1305. Despite it being just after high tide, it is quite calm here. At very high tides, the water comes in from the ocean above the sand spits which stretch from the western headland to the entrance. Therefore, with the wind from the north/north-west, there is the chance we will get some wave action at high tide tonight. We have lunch and then at 1600 take Veto to the sand spit once it has uncovered enough. The wind is hitting 24 knots, but the water is still calm. We speak to a couple who have been here four days due to the strong winds. Two more boats come in later, making a total of 24 here. We later have showers, sundowners and then left over roast port with mash potato. We go to bed at 2000 due to our early start. It was quite calm last night, except for a short period around 0015 when the waves came in from the ocean at high tide. The wind was a constant 20 knots till 0400 when it dropped to 15 to 16 knots. We get up at 0800. A few boats have left already, including one 9 metre yacht which we saw at Keppel Bay Marina (see above). God only knows how they got here considering the winds of the past three days. We are really worried about them considering today's forecast. We take Veto to the beach for an extended run and then have breakfast. The wind is 20 knots now and by 1030 it is mostly 24 knots. 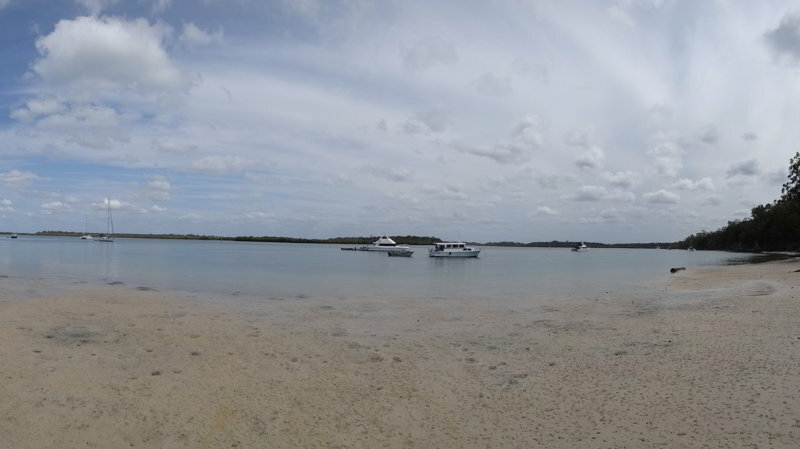 Two large cruisers leave for Lady Musgrave Island and as they exit the creek, the spray they produce is double the height of their boats. Once they are outside they seem to have second thoughts for a while as they discussed the conditions over the radio. However they eventually decide to continue as the wind is more behind them. We later hear another boat say to VMR “the wind conditions are a bit unexpected”. Well, considering we knew four days ago that today would be like this, it is a bit worrying that some people do not seem to check weather forecasts or perhaps understand them. Michael makes some scones for morning tea which we have with strawberry jam and cream. Very nice! 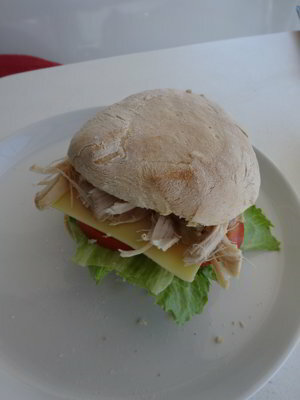 He then makes a loaf of bread and some rolls. The rolls are good, but the loaf needed to rise a bit more. We laze around as it is too windy to go to the beach and the sand spit is underwater. Later more boats come in and we have 26 boats anchored for the night. 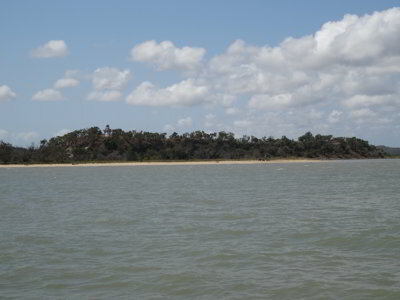 We take Veto to the sand spit for a run at 1600 and at 1650 we hear that the small yacht we are worried about is a few miles short of Bundaberg. However we never hear it actually log off once it gets there. 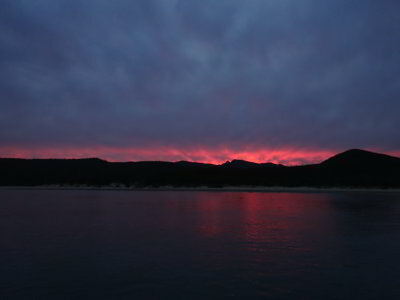 The wind drops at 1730 to 15 knots and later 13 knots. We have sundowners (a dry night for Michael and only one lass of red for Kelly). Kelly makes nachos for dinner. Michael writes up the blog after dinner and we again go to bed early as we want to leave shortly after 0500. The wind was 15 knots for most of the night but the water was calm. When we get up at 0500 the wind is only 5 knots. We make tea and coffee and then we head out. “We’ve got us a convoy”! We are the 7th yacht out of 9 to leave just after 0500. Three powerboats follow later. Once outside we pull out the screecher in 8 knots. We have to motorsail as we have current against us (1.5 knots). 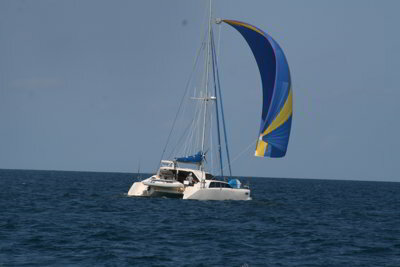 At 0840 we pull out the spinnaker in 8 to 12 knots. We still have to motorsail due to the current. Even later when the wind increases to 13 to 15 knots we have to keep an engine on to maintain the average we need to get to Burnett Heads (Bundaberg) before dark. 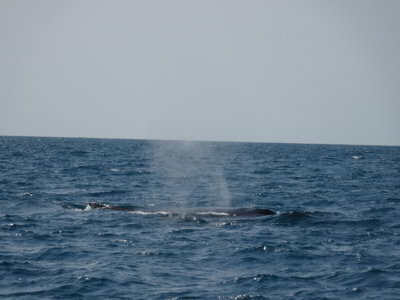 We see more humpback whales today, including one that surfaces about 20 metres from our stern. At 1430 we turn off the engine as we now have a slight current with us and we are doing anywhere from 5.5 to 6.1 knots. 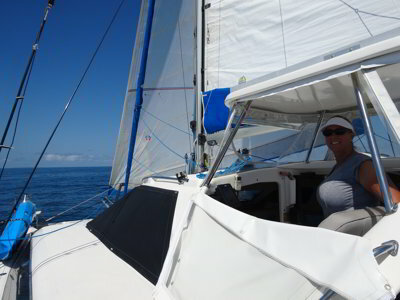 At 1500 we pull in the spinnaker as the wind increases to 19 knots and soon after it was a constant 20+ knots. We swap to the screecher and continue without an engine. The seas by now are 0.75 metres and quite sloppy, but we still have a nice sail. 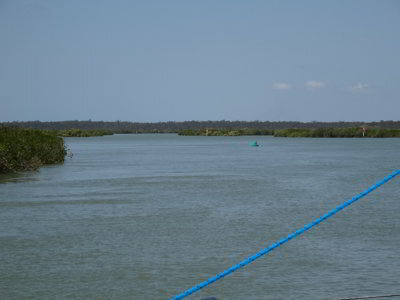 On the approach to the channel into the Burnett River, we swap to the genoa (and swap sides). It is very rough in the channel as we are side on to the sea. 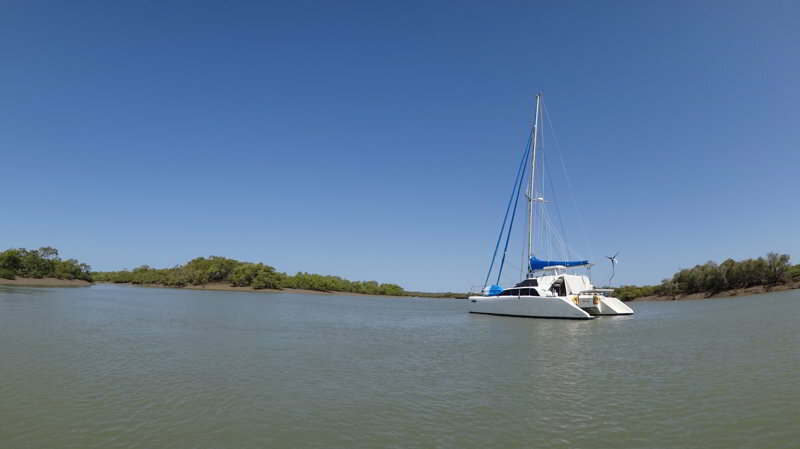 We decide to anchor north of the Bundaberg Sailing Club. The wind on the way in hit 24 knots and it is 20+ knot here. Luckily we are basically out of the tide here and are hanging into the wind so we do not have any side on slop. Michael takes Veto to the beach at the sailing club. We have showers and sundowners and then Kelly makes creamy pasta for dinner. Later the wind drops to 12 to 17 knots. We go to bed at 2100. 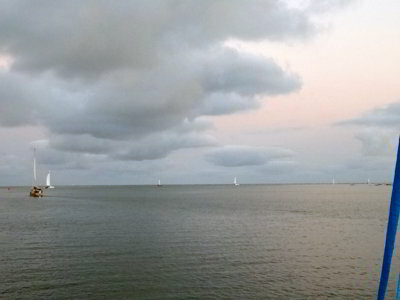 It was a calm night and the wind was mostly 12 knots. However at 0400 it picked back up to over 17 knots. At 0710 when we get up it is 18 to 20 knots. It soon increases to 25 knots and gets uncomfortable. Michael takes Veto to the beach right next to where we are anchored. Big mistake! Under a very thin layer of sand it is mud and he sinks almost to his knees. Veto gets her run and Michael manages to get Thunderbird 2 off, albeit with a lot of mud on the sides and floor. We have breakfast and at 0845 we decide to move. We up anchor and motor back down the river and and end up anchoring near our normal spot at the entrance. This is much better than where we were previously anchored, although there is a slight swell coming in from the ocean. The wind is now 16 to 20 knots. Michael cleans the boat’s trip log which has been not working properly, then he adds 66 litres of diesel to the main tank. Kelly greases the anchor winch and Michael greases T2’s steering. By 1245 the wind increases to a constant 22 knots with gusts of up to 32 knots. We decide to move again, this time to the northern side of the river opposite the marina. This will be much more protected, we should have anchored here yesterday. We anchor between the front and back lead lights and the training wall in about 8 metres. 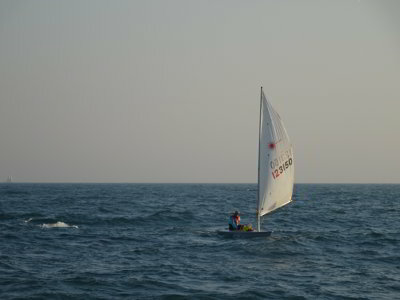 The wind later drops to about 12 to 15 knots but later goes back to 20 to 28 knots. Despite this it is a lot more comfortable as we have no swell from the ocean. We take Veto to the beach east of the marina. Once we are back we have showers and then sundowners. We hear VMR Bundaberg trying to call a large cruiser called Blue Moon. It seems that some people on shore think it is dragging its anchor. They get no response. Michael calls VMR and advises that on our AIS it is swinging in an arc but not dragging. It is amazing that people do not monitor their VHF radios, especially when the conditions are like today. After dark a yacht comes in and motors around trying to find a spot to anchor. Kelly tries a number of times to call them to help with advice, but again, no response. Kelly cooks chicken winglets with salad. Our original plan was to go to the Great Sandy Straits tomorrow as the weather was looking quite good. However, as of this evening it has changed to be as bad as today. We will probably not be going now, but we will check first thing tomorrow to see if it has changed again. We go to bed at 2100. At 0800 Michael takes Veto to the beach on the north side of the channel and on the way back stops off to see if Close Encounters has managed to fix their steering problem. 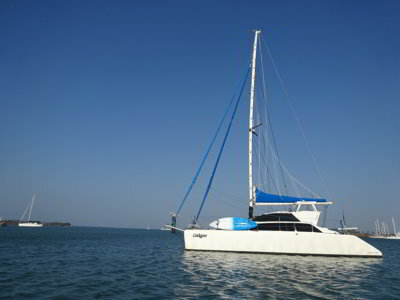 This yacht is owned by Ian and Heather and is based at Mooloolaba. Apparently when they did a gybe the hydraulic steering went and they then had to use the emergency steering. However, when entering the channel, the hydraulic steering started working to a certain degree. They have had no luck fixing, so plan to go into the marina shortly. Later we see them head there and before entering, they do a series of manoeuvres to make sure the steering is working enough to get them into the marina. They successfully berth. After breakfast we read and do some things on the computer. Michael also adds 15 litres of fuel to Thunderbird 2. At 1145 we take T2 and head into the Burnett Heads harbour. We tie up at the floating pontoon and walk to the town. This takes about 20 minutes. We go to a fish and chip shop opposite the hotel and order lunch. Quite good fish, chips and potato scallops. The wind is still 12 to 20 knots, but the forecast is for it to drop during the night. We go to bed at 2130. 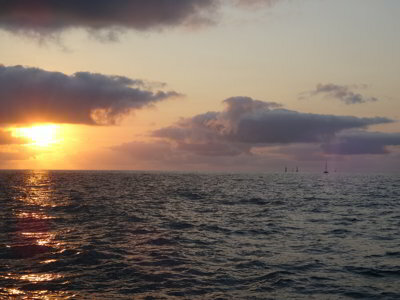 The seas were calm all night but the wind blew 10 to 15 knots till about 0200. It then dropped dramatically and at 0445 when we get up it is 6 knots westerly. We make tea and coffee and at 0505 we motor out. We leave the channel at 0525 and pull out the screecher. At least five other yachts and two cruisers leave, including Sub Zero, Heatwave and Leana. For the past few days on the VHF radio, we have been getting French speaking people. We assume that they are from New Caledonia which is over 750 nautical miles (1400 kilometres) away. We are also picking up ships on the AIS that are anchored there. Weird radio atmospherics! We hear more today as well. A bit south of Burnett Heads we see a tiny sailing dinghy which sails across in front of us and then turns and heads back to shore. We are well over a mile from shore and it is a bit choppy at the moment (but not too bad). We are doing about 4.9 knots into a 1.2 knot current with the engine running and the wind about 11 knots astern. 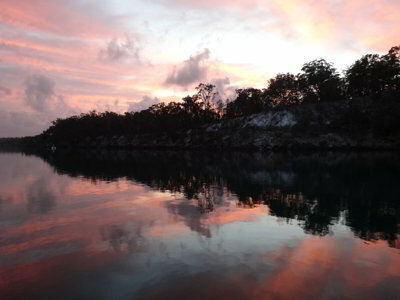 We need to average at least 5 knots to get to South White Cliffs on Fraser Island before sunset. At 0630 we change to the spinnaker but this is short lived. We pull it down at 0700 as the wind dies to 4 knots and goes south! We pull out the genoa and continue at about 4.8 knots close hauled. We change to the screecher at 0845 when the wind goes back to northerly and increases to 8 knots. The sea is calm with about a one metre swell from the north-east. The wind later increases to 10 to 15 knots and our speed to 5.2 into a 1.0 knot current. 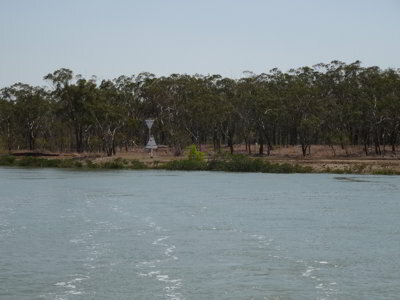 At 1155 we pass the Fairway Beacon and Kelly logs on with VMR Hervey Bay and off with VMR Bundaberg. At 1400 the wind goes easterly and we turn off the engine. We are now sailing at 5.5 to 7.1 knots in 15 to 18 knots of wind. We pass Kingfisher Resort at 1500 and continue sailing towards the Great Sandy Straits. We hit 8.5 knots with only a slight current behind us. A fantastic few hours of sailing, we wish we could have it like this more often. 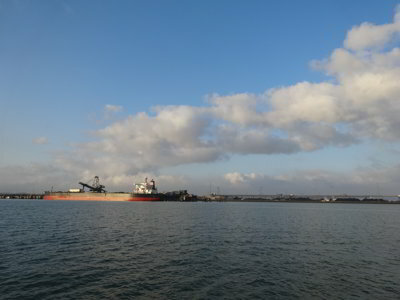 At 1615 we pull in the sail and motor the last little bit into the South White Cliffs anchorage. At 1640 we anchor in 11 metres. 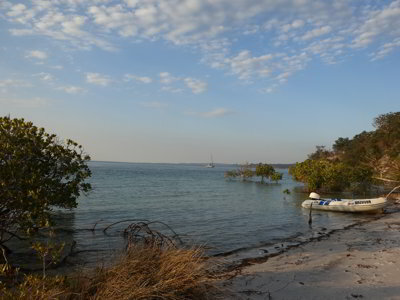 This anchorage is fairly deep in the most protected section, but further south you can anchor in about five metres but it is more open to southerly winds. It is millpond here and the wind under 10 knots north-easterly. We have showers and then sundowners on the back deck. There are a few bugs around, but not too bad. We have curry sausages and rice that Kelly made a few days ago (after a long sail it is great to have something already made). It looks like we will not be able to cross the Wide Bay Bar till about Wednesday as the seas are going up after tomorrow. Too bad we got here so late, if we were a few hours earlier we could have continued on towards Tin Can Bay and left tomorrow. It was an extremely calm night and we get up at 0515 as we have to use the last little bit of the incoming tide to travel towards the section of Great Sandy Straits where the north and south incoming tides meet. We need at tide of least 1.5 metres to safely cross the very shallow sections and also avoid battling into the very strong tidal currents that can be here. We leave at 0525 and motor with a slight current. We run at a lower than normal engine speed as we do not want to get to the meeting point too early. We have a minimum of 2.2 metres clearance (that is 3.3 metres deep) in a 2.5 metre high tide. We time it perfectly and have current behind us the whole way. We go into Garrys Anchorage via the northern entrance, we have 1.6 and 1.3 metres clearance at the two shallow sections. At 0720 we anchor in 4 metres. There are 16 boats here, although quite a few later leave. We have breakfast and then Michael creates a lot of new waypoints on OpenCPN on the laptop and transfers them to the chart plotter. He does all the way to Sydney. Of course we need to do them all again as we lost all the ones on the old chart plotter when it died (it could not easily be backed up). 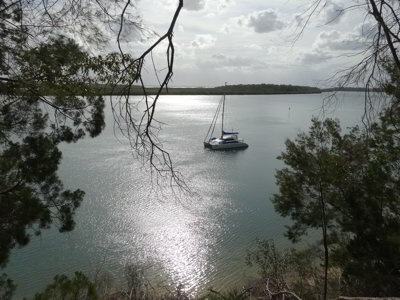 He then creates routes for the next few sections of the trip down to Ballina in NSW. After lunch Michael adds 22 litres of diesel to the tank and then checks the engine oil and the sail drive oil. 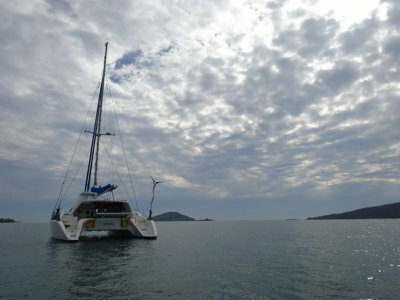 The oil in the sail drives looks okay, so it seems our numerous changes since Townsville have worked. At 1505 we go for a walk to the north along the four wheel drive track. It looks like no vehicles have been here in the four months since we were last here. Certainly no one appears to have camped here either (we learn ini 2018 that the road to here is closed to all vehicles). You get nice views of the boat anchored along here. We walk for about 30 minutes and then turn around. On the way to the beach we stop at Leana (David came in a few hours ago) and invite him over to watch the NRL Grand Final tonight. He will come over after 1800. Today has been overcast and much cooler than recent weeks. A change is on its way and rain is forecast for the next few days. We have not had any rain for a couple of months and no prolonged rain since we were here over four months ago. We are back on Catlypso by 1630 and have showers before reading a bit. We have sundowners and we put the football on. We can get pretty good reception on the TV, it only sometimes goes funny if we turn a bit. David comes over and we sort of watch the match, but lose interest once Melbourne starts to get all over North Queensland. They end up winning 34 to 8. Anyway, we have a nice time talking to David. We end up not eating dinner as nibblies were good and we had a few more drinks than normal. He goes back to Leana about 2130 and we go to bed. It started raining at about 0200 and it continues all morning till about 1000. It is not heavy, but very constant. We get up at 0800 and have breakfast. We put up the rear rain curtains as soon as we can, at least this stops some rain getting in, although we have a lot of water run off from outside. It starts raining again at 1145. Michael spends his time doing photographs for our blog and then writing it up. Kelly updates the boat's inventory. We have hot dogs for lunch, something different. The rain gets very heavy in the afternoon. The dinghy ends up with a huge amount of water in it. Michael has to lift the bow up and pull out the bung so that it could drain. It would have been too heavy to lift out of the water otherwise. Michael discovers why the freshwater pump has been cycling for a split second every 10 minutes or so. Looks like something was pushing very slightly on the starboard hot water tank relief valve. Michael also flushes the watermaker. We have sundowners but no drinks, some garlic bread and stir fry beef and rice. The rain continues, so we go to bed, at least it is warm there.